Tonight's guest review is from the terrific Coheteboy, and covers a line that's been tempting me in a mighty way - the Disney Magical Collection. Take it away! For decade upon decade the only toys with any quality made for Disney fans were the wide number of assorted plush sold at signature theme parks and stores. It wasn't long, however, until seperate toy lines for films made up of PVCs or dolls and even a few action figures were eventually licensed by a variety of companies (Mattel and Hasbro for example). But nothing ever stood out for the action figure enthusiast. Sure there were figures with some decent sculpt and accessories, but there wasn't one brand for every Disney property.... until now. The toys based from popular Disney Films never impressed me but Tomy of Japan has satisfied my yearning of having one unified line of Disney action figures with great sculpts beginning back in 2001. It took two more LONG years to finally bring these great collectibles to the states for other fans to enjoy. To date, Tomy has released approximately 78 different figures with characters spanning from Snow White to Lilo & Stitch and Steamboat Willy to Kingdom Hearts. The U.S. can expect the same exact figures and packaging as the ones in Japan, which is great in one way, confusing in another. The three-digit numbering system which Tomy has applied to each figure released made it most convenient to track which figures you're missing as well as which figures are soon to come out. But since the U.S. release is not following the same order that Japan and Asia has seen, the numbering system will prove most frustrating to collectors. 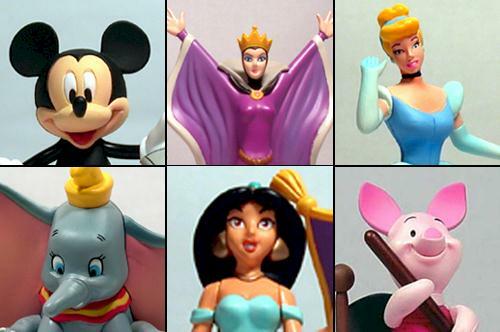 For example, the Mickey Mouse (from Runaway Brain) is figure #033 while The Queen (from Snow White) is #012. This may make it difficult for many collectors since they'll have gigantic holes in their collection, but they can always make a trip to Japan (or any other city in Asia) to fill in the gaps. 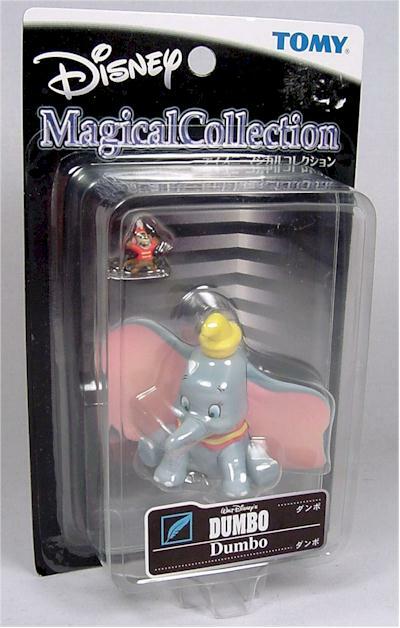 The first set slated for the U.S. was initially set to feature figures from the popular video game Kingdom Hearts, but was instead changed to include the following figures: Cinderella, Piglet (The Many Adventures of Winnie the Pooh), Jasmine (Aladdin), Dumbo, The Queen (Snow White and the Seven Dwarfs), and Mickey Mouse (Runaway Brain). The packaging remains identical to its Asian counterpart, and I'm really glad they did so. The design isn't the brightest or most colorful, but what I like about it is that what you see is what you get. The card remains small with a large bubble allowing you to clearly view the figure and its accessories. The front of each card is identical, with only a sticker on the front of the bubble telling you what character you're getting and from what movie he/she appeared. 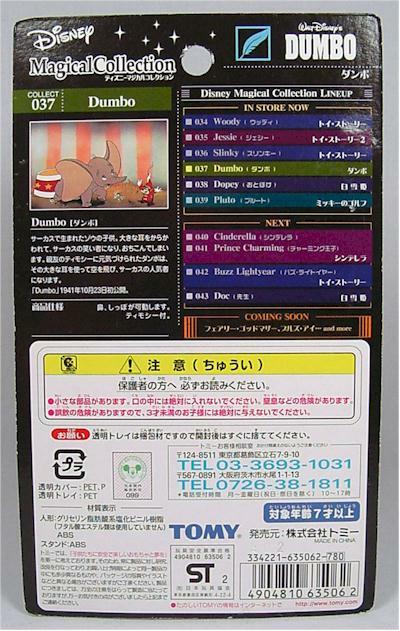 The back of the card features a photo of the animated version along with a small blurb describing the characters (in Japanese, unfortunately). The back also details which figures are in the current series, as well as listing the figures coming in the next batch. Keep in mind that this won't apply to US collectors since these figures have already been released in Asia. The packaging is simple but it really does a great job. Now all you need is a translator and you're all set. What impressed me the most about this toy line, along with the range of characters made, are the terrific sculpts. Each character's likeness is captured so brilliantly it's as if the figure stepped right out of the animated films. There was no detail that wasn't included in each character. From the ruffles of Cinderella's dress to just about anything else. The only disappointing sculpt is the Queen. She's not as accurate as the rest of the characters, but she still looks pretty decent. Human characters are always going to be more difficult than the others, but Tomy did a very nice job for the most part. The paint ops are generally spot on, but there might be some instances where you'll find some inaccuracies. The figures I purchased, however, are all very well done. All of the colors used aren't dull but vivid and rich, which makes for a pretty impressive bunch. There is even amazing detail in the smallest of figures (Timothy and the 2 mice from Cinderella). Overall, you shouldn't be disappointed with the paint work here. Where I give high marks for just about every other category, the area I have to be harsh on is articulation. You'll be lucky if you even get three points of articulation on a figure because there are more than a few that barely have any at all. Mickey Mouse is basically a bendie figure, with 5 limbs to flex and contort (the fifth being the tail). 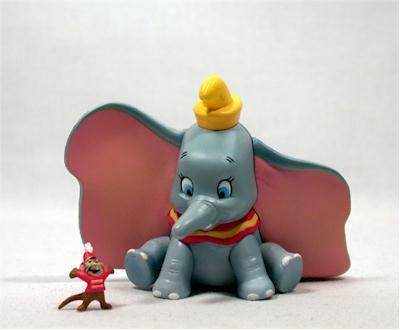 Both Dumbo and The Queen have absolutely NO points of articulation. Cinderella and Jasmine both have a decent five points and little Piglet sports four. Truthfully though, it doesn't appear that this line was made for fans of articulation but rather for fans of the art. These figures serve as three-dimensional pieces of art and are meant to be displayed instead of played with. But still, some extra points of articulation never hurt. While the sculpts are great, the accessories add just a small touch of detail to make these figures really worth collecting. In most cases you aren't getting accessories but EXTRA characters! That's certainly the case with three of the figures in this set. But first off, each of these figures come with a stand to help the figures remain standing. A very nice touch although most of these figures stand (or sit) on their own just fine. Mickey Mouse comes with a newspaper accessory, something he flips through in the Oscar Nominated cartoon short, Runaway Brain. 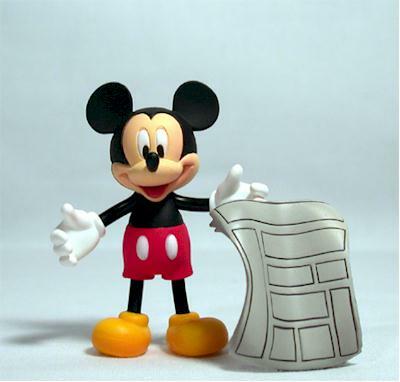 The newspaper, which could have been a flat boring item has become a very nicely sculpted piece of reading material that can be held in Mickey's hands. 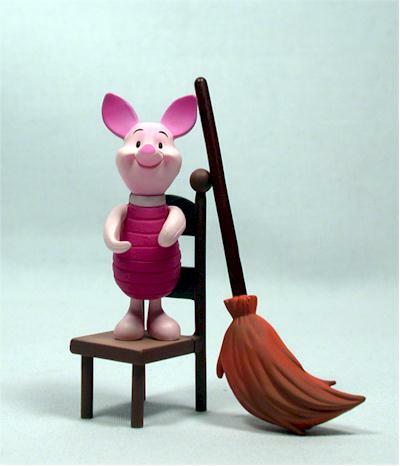 Piglet, the small friend of Pooh comes with a chair and a broom as seen in the cartoon short. It's great to see an accessory such as a broom get such a nice coat of paint. It's especially nice that they even included a broom and a chair... accessories that don't exactly pop into mind when thinking of Piglet. Dumbo, Cinderella, and Jasmine don't come with accessories but are even luckier to have their companions included. Dumbo is never seen without his best friend Timothy Mouse, and that's exactly what he comes with. It's amazing that a figure so small was included, but it's even better when they bother to think about scale. 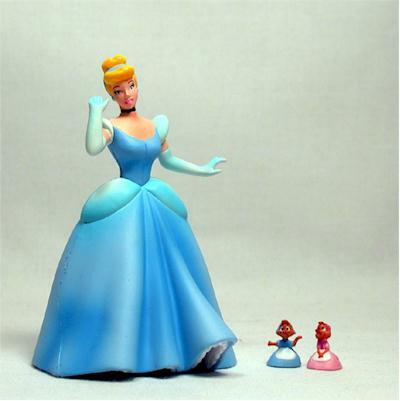 Cinderella also comes with mice as companions: Suzy and Perla. Again, just like Timothy Mouse with Dumbo, the thought of having these tiny characters included is reason enough to be excited. If you guys are wondering why Cindy doesn't come with a glass slipper, that's reserved for Prince Charming. 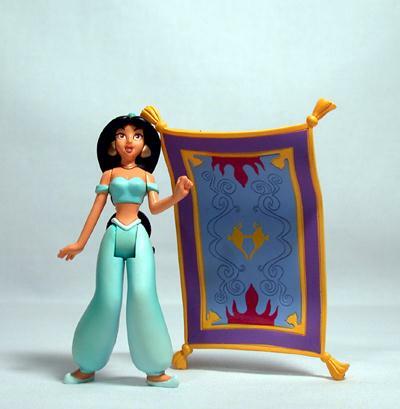 While Jasmine's accessory/friend isn't as well detailed as one would hope, a Magic Carpet is better than anything. 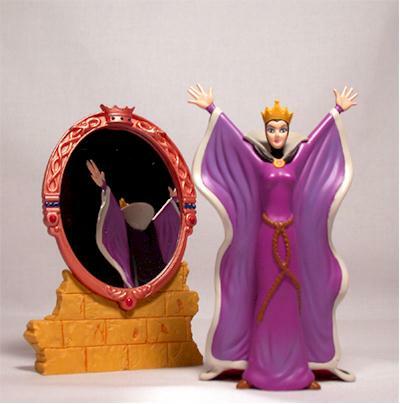 But the most amazing accessory in this first set has to be the Queen's Magic Mirror. When put together, it's approximately the same size as the Queen herself! And it's an actual working mirror to boot! Unfortunately, the face of the Magic Mirror can't be seen, but one can always pretend. These figures should be selling for about $6-7 a piece and for that, I think it's fair. A toyline with sculpts as great as these and with as many characters is always something to cheer about. If you pay import prices of $8-10, then you can take away a half or entire star. I'm a huge Disney animation nut at heart so I'm finding it a little hard to really offer anything negative about this line. The sculpts are 98% dead on with great paint application and well thought out accessories. Articulation is lacking but these are meant for display anyway. I've always dreamt of having every Disney character ever made in action figure form and all in scale with each other as well (although that becomes an issue later on... more on that in upcoming reviews). Since I have all of the other figures already released from Japan, I can honestly tell you that this is just the beginning. If you don't get on board now, there'll be a handful of figures later on that will get you hooked... and you'll just end up spending more trying to get the ones you missed! This toy line has been extremely fun for me to collect and it looks even better when displayed. So if you're even the slightest of Disney fan, you might want to keep an eye on this line or you might find yourself regretting it later. - Beans Toys has sets A and C in stock right now for about $30 for all six. A great price! Coheteboy is an avid toy collector and now confirmed Disney nut. He also writes for Galactic Hunter.